We discussed in November about the LCBO’s e-commerce web site, LCBOgifts.com. 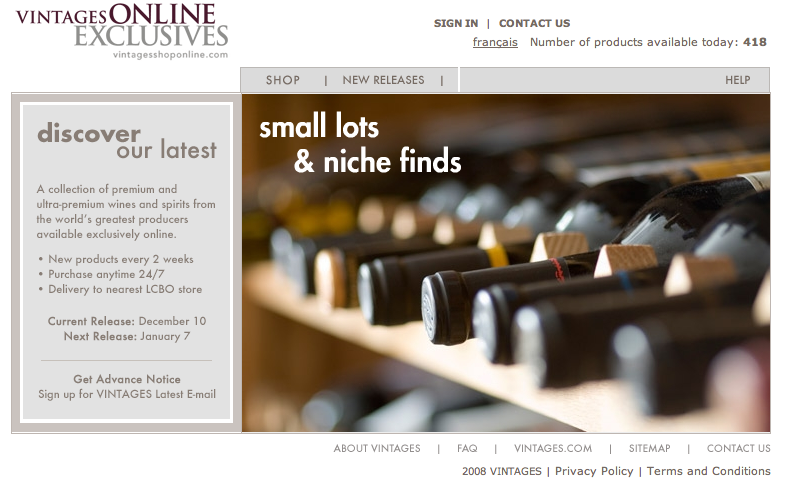 Now Vintages, the LCBO’s premium wine and spirits division has launched an e-commerce web site of its own. Called Vintages Online Exclusives, the site “offers an additional portfolio of premium fine wines and spirits”, presumably products that aren’t regularly available in stores. The site promises new products available every two weeks, and currently has 418 products available. There’s a handy product counter in the top right corner of the home page. What makes this site not quite the same as traditional e-commerce is that it does not deliver purchases to the home, instead to any LCBO store. Looking at this site I am impressed by its concept. It offers a new set of products that consumers can get anywhere in the province – so if a wine connoisseur lives in city where the LCBO stores don’t have a strong selection, this site allows them to get some new things to try. And if you don’t want to go to the trouble of tracking down a particular product if its not at your local store, this can get it there. The inventory of Vintages Online is even integrated with the LCBO’s main web site, so a product searched on LCBO will come up as available to buy online through Vintages. What’s unfortunate about this, however, is since Vintages does not offer beer (they discontinued beer support a few years ago), there’s no premium beer available through this service. It’s a real shame since beer would particularly benefit from this kind of service. Often it is difficult finding the LCBO’s beer seasonal releases in smaller stores, leaving consumers driving from store to store in an attempt to track them down. But more importantly, this kind of system would be perfect to test small batch sales of new or different beers – the LCBO would not have to go to the trouble of full distribution roll-out and shelving. This would have the potential of putting different beers on the market, see how they perform and then make a decision to release it. As it stands the LCBO generally favours products that have sold well in the past rather than taking a chance on niche beers. This would be a perfect test channel for niche beers. But we’re used having beer being left out, and here’s another example.